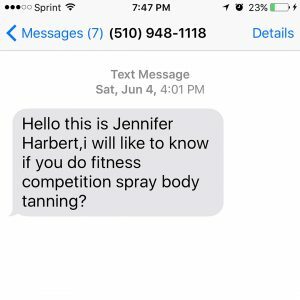 Today I wanted to write about an airbrush tanning scam that’s been going around and I am hoping to make everyone else in our airbrush tanning industry aware of this, hoping to stop those scammers. 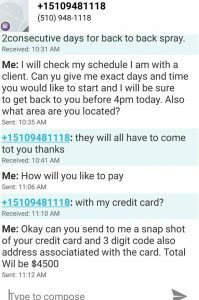 Many of my previous students have been contacted by these scammers and we all discussed this in our private Facebook group. I know that not everyone is always online so I am hoping it will bring additional awareness here through the website. What the scammer usually hope for is that you charge a credit card for an extreme large amount. They will usually give you a stolen credit card and ask you to charge a bit more and then refund you the extra additional money that you charged in cash. Then later on, after the credit card company finds out that it was a fraudulent charge, the credit card company will refund the money and take it away from you and then you will be responsible for paying everything back. This has been going on in many different industries. One of my previous student is also a nail technician and she reported that this was also in the nail industry. So I am assuming that this is probably going on in the whole salon industry. I hope that nobody has fallen for this. So far I have not heard of any horror stories but this is why I wanted to write about it and hoping to alert everyone. I hope that nobody falls for this and that we can put an end to this scam. 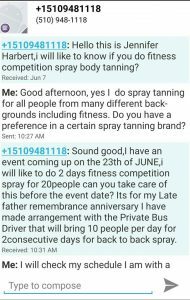 Anyone who wishes to provide more or additional information to this may add below this blog post.